Tough going but fantastic team effort from all! What a XC! Snow coming down on route to Shrewsbury meant cold, slushy wet fields, a brilliant deep river crossing (cold), another deep ‘field’ crossing (cold too! ), lots more muddy tracks and fields and a wall to jump – it was hard but exciting. I was really proud of everyone yesterday – a) for making the trek there, b) for putting their all into what really was a tough, tough day and c) for still smiling at the end of it. You guys are awesome! So huge well done to Miranda Grant and Andrea Rowlands who brought the ladies home in 3rd and 4th place, followed by Helen Blair, Becki Law, Ellie Salisbury, Alison Donnelly and Viv Edwards. The same goes for the 4 fantastic Eryri men who kept the Masters team going strong – Matthew Fortes(18th overall), Arwel Lewis, Russell Owen and Eurwyn Edwards. Really, really well done. Full results will be available on the NWXC website. Big thanks to Arwel and Matthew for getting us there and back safely on the bus and to Shrewsbury AC/Bernie Jones and co for putting on such a great day despite the weather. 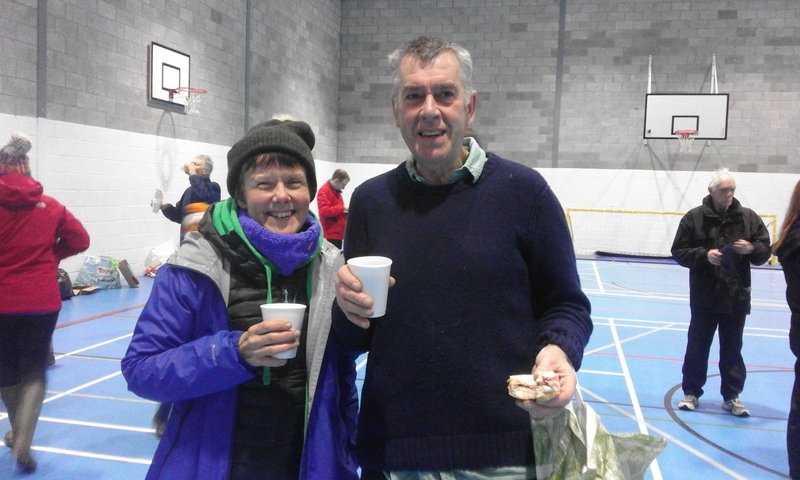 The cakes, sandwiches, tea and coffee in a lovely warm sports hall after were much appreciated! Next, last and all important league fixture + prize giving is on SATURDAY 3RD FEBRUARY IN OSWESTRY WITH AN EARLIER START TIME OF 1PM FOR THE FIRST RACE AND 1.45PM FOR THE SECOND RACE. More details to follow but please let me know if you would like a space on the free bus. Thanks Russ for the photos, sorry we didn’t get everyone, too cold! 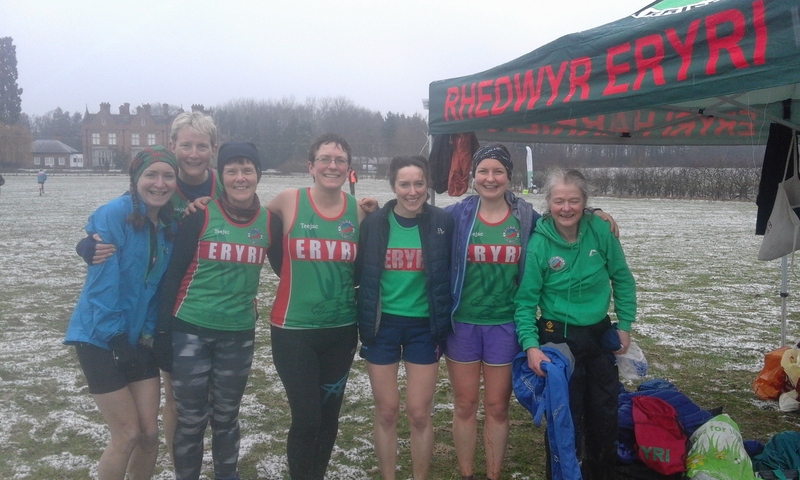 6 Eryri Harriers represented the club in the 3rd race of the Borders Road Running League 2017/18 Season at Pensarn, near Abergele on Sunday 14th January. On a dry, cool breezy day, there were 375 finishers on the out and back 5 mile, mainly flat course. 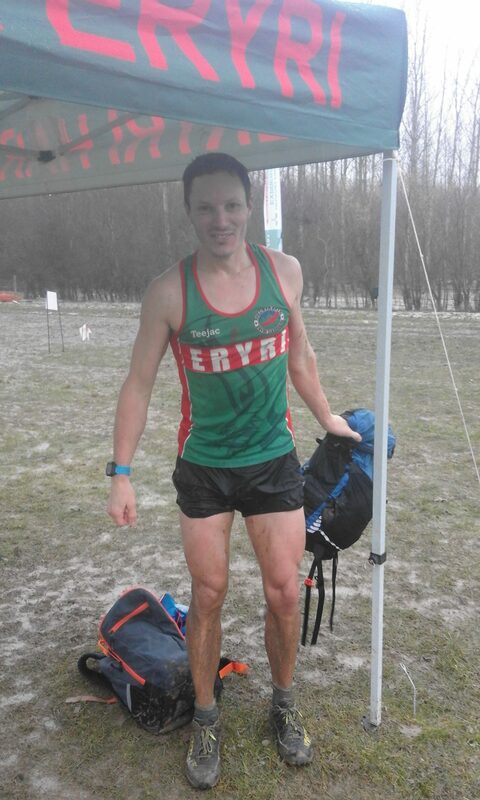 Eryri were led home by Arwel Lewis in 146th position followed by 165th placed Ashley Wager who disappointingly were the only two Eryri male representatives at the event! On a positive note, Eryri’s women fielded a full team, led home by 193rd placed Becki Law, followed by: 202nd Helen Blair. 213th Jenny Heming and 331st Alison Donnelly. The next event of the season will be on Home ground on Sunday 18th February at Caernarfon with a 11:00am start on the usual 10k race route. 11 Eryri Harriers were amongst the 379 finishers in the annual Twin Piers 10k from Llandudno to Colwyn Bay on Saturday 13th January. Except for a slight headwind on most of the race route. Weather conditions were very good, dry and not too cold. First home for Eryri in 12th position was Arthur Connell 37:22 followed by: 16th & 1st MV/55 Russell Owen 38:00. 31st & 2nd Female Catherine Higgs 39:33 closely followed by 32nd & 1st FV/40 Andrea Rowlands 39:42. 65th & 2nd MV/55 Arwel Lewis 42:32. 73rd & 3rd MV/60 Iwan Edgar 43:22. 121st Maldwyn Evans 47:18. 172nd Barry Davies 50:54. 176th Harri Roberts 51:16. 321st Roy Jardine 63:16 and 373rd Iorwerth Roberts 71:35. At the front of the field, there was a very close and exciting finish with Owen Roberts pulling away in the final stages to win in a time of 33:46 ahead of Michael Corrales (NWRRC) 33:50 and Simon Cole (Gogs Tri) 33:53 with Martin Green 4th & 1st MV/40 34:07. The Premier Inn on Swansea waterfront has cheap rooms at the moment if you don’t fancy a 4-ish hour drive before running – cheers Helen! Let me know if you are planning on running and you need any help organising a lift-share. Whilst we were at Rhug, two other Eryri ladies were flying the flag for the Welsh team in Antrim, Northern Ireland at the British Athletics Cross Challenge – Bronwen Jenkinson was 14th female overall (3rd U23, also helping the Welsh team to second) in a strong field including some top international runners and Annabelle McQueen was also amazing, coming 13th overall in her race (8th U20) in another strong field – very well done ladies! Massive well done to everyone at today’s North Wales XC Championships at the lovely Rhug Farm, Corwen – what a good (but cold!) day! Lots of gold, silver and bronze medals and plenty of team spirit – thanks everyone for a great day and well done! 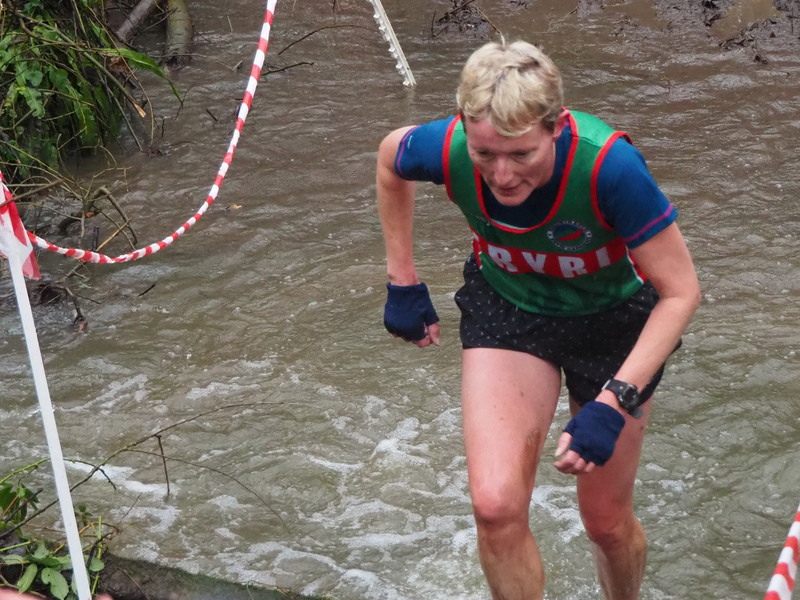 Fifteen Eryri Harriers took part in the undulating, scenic, farmland cross-country course complete with a river crossing or two. Helen’s James Blair was 16th in his race, with a super sprint finish! Six Eryri ladies and 2 Eryri U17s ran in the 5.7km race, with Miranda Grant having a fantastic first race back since injury coming in second overall and gold in the FV35 category. Becki Law was next Eryri home and 3rd in the senior lady category. Helen Blair was next and received a silver medal in the FV50 category, along with Ellie Salisbury who also received a silver medal in the FV55 category, followed by Alison Donelly and Maggie Oliver who received a silver medal in the FV70 category. This fantastic team effort brought home two team gold medals (senior ladies and vets) and a team bronze (‘super’ vets category) – huge well done ladies!!! The U17s had a great race too, with Eryri newcomer Tom Wood working his way through to a bronze medal, followed by another strong run fromCallum OD! Well done both! In the men’s race, Russel Bentley (running for Kent AC as per championship rules) was a brilliant 3rd overall, followed by Matthew Fortes, Russell Owen who gained a silver medal in the V55 category, Emlyn Owen, Ben Beachell, John Davies (nice one on your first ever cross country!) and Steffan Rhys Evans. You guys did an awesome job and you all contributed towards a team silver medal in the senior men’s category (6 to count). The vets team also gained a bronze medal – well done all, brilliant! Medals as above when I next see you. Will post link to full results when available. Many thanks Arwel Lewis who was refereeing the event so that it can happen and Mike Blake for his usual support on the field! Becki Law 21st (2nd F). Also of note – Paul Hodges 25th (2nd v50) and Maggie and Alwyn 1st v70s ! !